OpKey Seat License is generated by the OpKey team which is based on the unique machine code. In order to generate machine code, run OpKey Codegen utility & then share machine code with OpKey support team and then get respective license code. You can download Codegen v2.exe from here. Place this Codegen on your machine. Send this Machine Code to Support@opkey.com. OpKey Support team revert you with the requested license code for OpKey Agent & OpKey Plugins. Make sure that you have installed supporting components (Java, OpKey Execution Agent, OpKey Smart Recorder & OpKey Plugins) to work on OpKey Web successfully. Please Refer Installing supporting components for details about installation of supporting components. For a newly regstered OpKey Web account, the configured OpKey Agent has inbuilt license of one month for OpKey Execution Agent along with pre-installed default plugins (OpKey Desktop, IE-Plugin, OpKey Web, and Utility). Once your license get expired, you need to generate machine code by using Codegen utility, share with OpKey Support team to get license code. Once you get the license code of OpKey Execution Agent, launch OpKey Agent. Click on the Settings button on Agent Dashboard page. 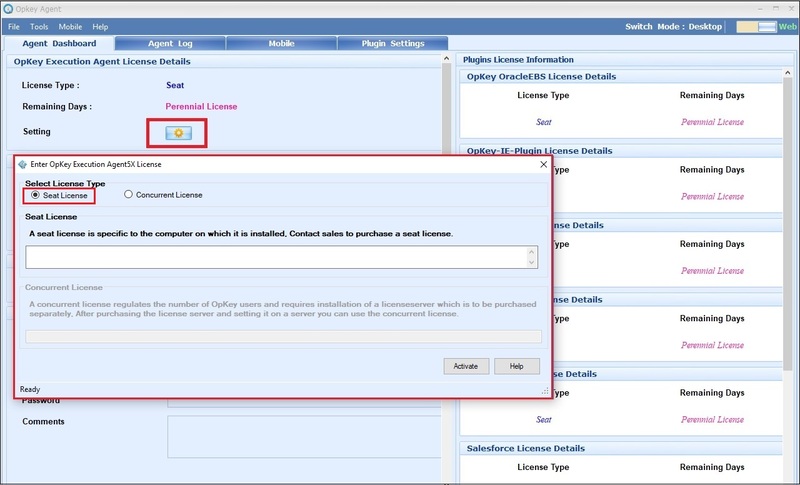 Select Seat License option and fill the license code in the given field. Click on Activate to apply the specified license code. There are 4 default plugins (OpKey Desktop, IE-Plugin, OpKey Web, and Utility) which get installed with OpKey Execution Agent. For other required plugins, you need to contact with OpKey support team (support@opkey.com). Further, you need to install them on your machine & relaunch the OpKey Agent. Share your machine code on support@opkey.com to get license code. Go to the Plugins License Information section, click on Settings icon, select Seat License & enter license code. Click on Activate to apply the license code. Your Plugin license will be updated.